Remember the days before the Mueller report dropped, when many of us held out hopes that the outcome would put an end to the partisan bickering about Russian collusion? Ah, those were the days. Now we know better––the report has put nothing to bed; in fact, it’s only inspired more fighting. The most recent speculation about the report comes from George Conway, husband of Kellyanne Conway, a woman with such a tenuous grasp on reality that she makes the Joker look like the Pope. 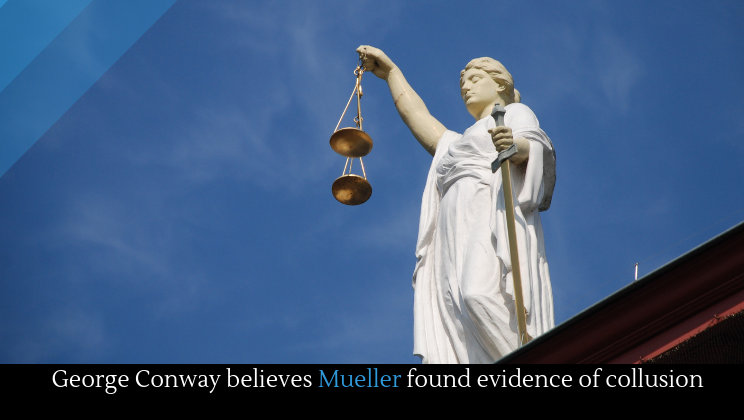 Conway said that if the Mueller report had found no evidence of collusion between the Trump campaign and Russia, then the report would have said “no evidence of collusion.” And if the report said that, then Barr’s summary of the report would have used the same phrase. Barr’s summary didn’t use the phrase; ergo, it’s not in the Mueller report. The report did say, however, that the nearly two-year investigation “did not establish that members of the Trump campaign conspired or coordinated with the Russian government in its election interference activities.” Conway is implying––like others have––that just because Mueller was unable to prove conclusively that there was collusion does not mean there wasn’t collusion.